According to multiple U.S. Securities and Exchange Commission filings made public on Tuesday, the stock vested on April 1 originate from Apple RSU incentive plans meted out on March 3, 2014, and Oct. 17, 2014. The two awards included 53,056 and 40,955 RSUs, respectively. 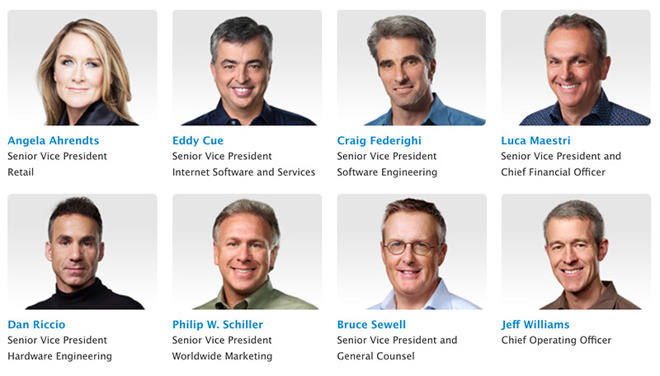 Six executives — Apple COO Jeff Williams, SVP and General Counsel Bruce Sewell, SVP of Worldwide Marketing Phil Schiller, SVP of Internet Software and Services Eddy Cue, SVP of Software Engineering Craig Federighi and SVP of Hardware Engineering Dan Riccio — received grants from both plans, meaning their awards converted into 94,010 common stock units. At the end of trading on Tuesday, the shares were worth just over $13.6 million. In addition to the statutory stock grant, Cue purchased 236 shares of Apple common stock on Jan. 31, 2017, under the company's Employee Stock Purchase Plan (ESPP). Apple SVP of Retail Angela Ahrendts and CFO Luca Maestri also saw RSUs vest as part of the October 2014 incentive plan, netting each executive shares worth about $6 million. As is standard operating procedure, Apple withheld 46,214 shares from awards received by Cue, Schiller, Federighi, Riccio, Williams and Sewell to satisfy tax laws. The company withheld 19,632 shares from Ahrendts 20,648 shares from Maestri for the same reason. Cue and Schiller shuffled a respective 48,032 and 47,796 shares to family trusts following last week's vesting. Schiller ultimately sold those shares at a price of $143.32, netting $6.9 million. The vested stock awards arrive after Apple's executive team missed out on bonus pay last year due to the company's comparatively poor fiscal 2016 results. Apple generated $215.6 billion in net sales and operating income of $60 billion, but the performance was not up to standards set by Apple's compensation committee. Rumor: Supply chain issues with 'iPhone 8' 3D sensors may lead to late launch in Oct. or Nov.